Decamping from Montpelier, Governor Phil Scott’s administration spent Tuesday in Orange County for their twelfth “Capital for a Day” event with the hope of bringing more attention and dialogue to the residents of central Vermont. Beginning with a morning cabinet meeting at the Limlaw Family Maple Tree Farm in West Topsham, the administration then stopped by the Thetford Academy before making the journey to Randolph. Once there, the party spent the afternoon and early evening speaking with community leaders at Gifford Medical Center, The Herald, and a meeting with a variety of business leaders at the Randolph Village fire station. Accompanying Scott on his visit with Herald reporters was Secretary of Administration Suzanne Young, Secretary of Transportation Joe Flynn, Secretary of Human Services Al Gobeille, and Secretary of Natural Resources Julie Moore, each of whom addressed questions on topics such as the rising cost of maintaining roads and bridges, the state’s response to the declining dairy industry, and addressing Vermont’s finite capacity for acute mental health care. 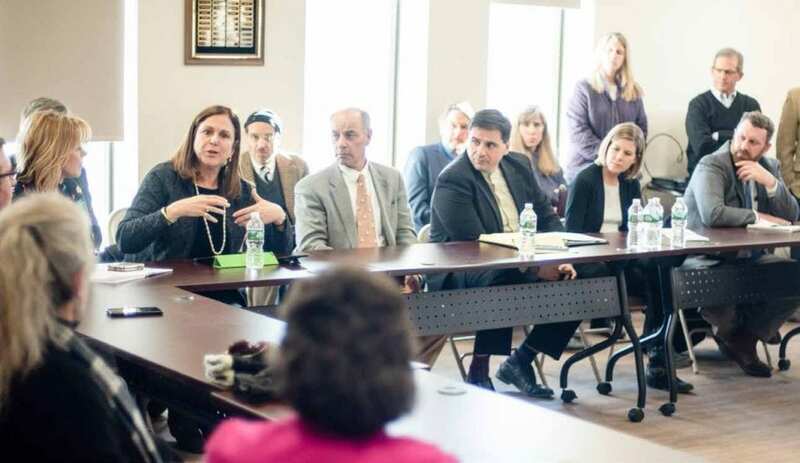 For the latter half of the afternoon and into the early evening, the governor met with Randolph’s business community, including many of those involved in the Randolph Region Re-Energized groups that have been working toward reinvigorating the struggling downtown district. “You’ve got all the pieces to do some great things,” Scott told the group, citing downtown’s relative proximity to Gifford Medical Center, Vermont Technical College, and access to one of the governor’s favorite sectors—technical education, both at VTC and Randolph Technical Career Center. In examining some of the issues facing the region’s small downtowns, Gov. Scott also noted the importance of affordable housing and cited his administrations previous spending of $100 million for Vermont housing projects, particularly for young Vermont residents, some of whom may have been recruited through his controversial remote worker program. A consistent topic throughout the day was addressing the state’s changing workforce demographics, particularly in regard to technical careers and the rising age of the average Vermont worker, many of whom are approaching retirement. “We have all these jobs, but nobody to fill them!” said Scott earfrom lier in the day. Striking a more positive tone at the fire station, Jeff Tucker—who has been with Dubois & King for nearly 60 years—told the governor that despite “government headwinds” his firm has been successfully recruiting engineers, doubling that company’s workforce over the past eight or nine years. Also joining the governor in Randolph was Mike Snyder, who serves as commissioner of forests, parks, and recreation. Citing a $100,000 plan to help communities to expand their recreational opportunities, Snyder also said his department was working to update the state’s map of scenic byways, dovetailing with other region-wide efforts to revamp area recreational maps for activities such as snowshoeing, skiing, cycling, and mountain biking.